With the ninth anniversary of the 9/11 attacks upon us, it’s hard to avoid the sense that there is an angry edge to what had, in the past, been a somber, solemn occasion. Yes, a big part of this is the roiling debate over the proposed mosque near Ground Zero. This debate shows no signs of going away any time soon. Whatever you happen to believe about the mosque proposal, most decent folks agree that September 11 is a day to set aside such differences and remember the sacrifices made in lower Manhattan on that sad day. Trouble is, it’s getting harder and harder to focus only on the acts of bravery and valiance. You’ve got hate preachers such as Bill Keller traveling to Ground Zero to put on an ugly show. You’ve got ailing first responders still suffering from the effects of the work they did at the pile. And you’ve got all manner of conspiracy theorists still trying to figure out whether it was President Bush or the United Nations or some other evil genius who actually toppled the buildings that day, rather than al-Qaeda. In short, it’s increasingly difficult to follow the noble example of service and sacrifice set on that terrible day nine years ago. Thankfully, we have the Lynch family to remind us. “We always knew we wanted to make something good out of evil,” Jack Lynch said in an interview this past weekend. Lynch, a Kerry native, is the father of Michael Francis Lynch, a Bronx-born firefighter who had been assigned to a firehouse in his native borough. On September 11, 2001, however, Michael had been rotated to a Manhattan house. He was one of a dozen firefighters to die from that house when the towers fell. It was not until March 2002 that Michael’s remains were identified, in part because of the green Celtic Cross on his shoulder. It was said that Michael’s remains were intertwined with that of another person, indicating he’d been assisting this person at the time of the collapse. In the weeks and months which followed 9/11, the Lynch family -- Jack and his Sligo-born wife, Kathleen, raised 10 children -- decided to start a college scholarship fund in Michael’s name. 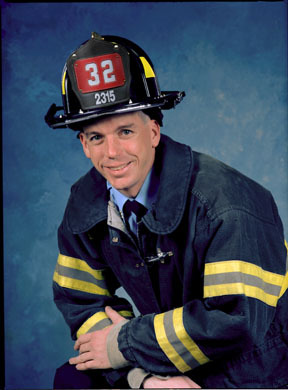 To date, the Michael Lynch Memorial has granted well over $1 million in scholarship money to children of FDNY families, as well as victims of 9/11, or other fires or disasters. “It’s actually closer to a million and a half now,” Lynch notes with understandable pride. In this sense, despite the terrible loss they have endured, the Lynches have done something so many of us have been unable to do. They have risen above the day-to-day squabbles which inevitably distract us in this post-9/11 world and continued to set an example of service and dedication and sacrifice. Indeed, the Michael Lynch Foundation (www.mlynch.org) is very much a family affair, with each of Mike’s brothers and sisters playing integral roles. For example, the ninth annual Lynch Foundation golf outing will be held on September 17 at Pelham Bay Golf Course in the Bronx. That event, along with many others throughout the year, is organized by Michael’s brother Thomas. Other family members handle the scholarship application process, the foundation’s legal business, its website and more. This September 11, we should not only remember the valiant sacrifices of Michael Lynch and his fallen comrades. We should also strive to emulate the Lynch family, who remind us that the most noble thing we can do is simply try to make the world a better place.